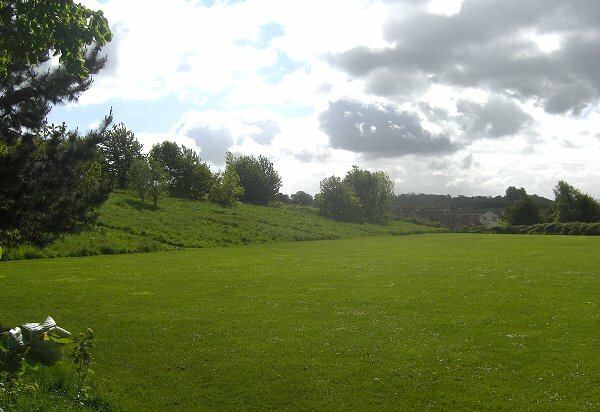 An early deed dated 16 August 1613 mentions "one close of meadow containing 4 acres called Milkeford" and the 1759 Terrier, in referring to the boundaries of the great Middle Field of Kingston Manor, noted Milford several times as follows ".... From Gore Corner next the Highway to Goldcroft Lane end and up to Milkford Lane end.... In John Vicars close at Milkeford Lane end.... In Thos Phelps Close at Milkeford." The origin of the name is questionable; a place name 'Milford' usually derives from the "mill's ford" but since there has never been a mill in this area of Yeovil that is most unlikely. It might refer to a ford crossing a 'milky' stream - again unlikely. 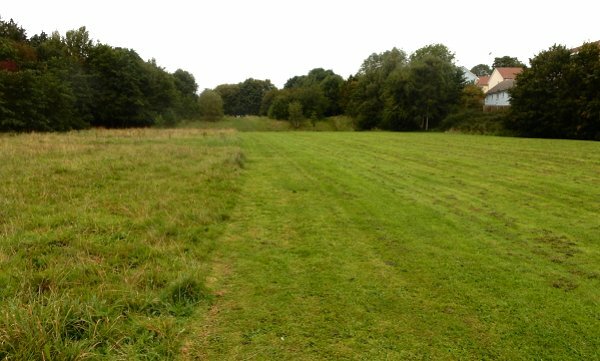 The third option might be that the field was originally owned by a man called Milkeford or Millford. We shall probably never know. Milford Stream, also known as Milford Brook, is one of Yeovil's two 'lost' streams (see also the Rackel Stream). 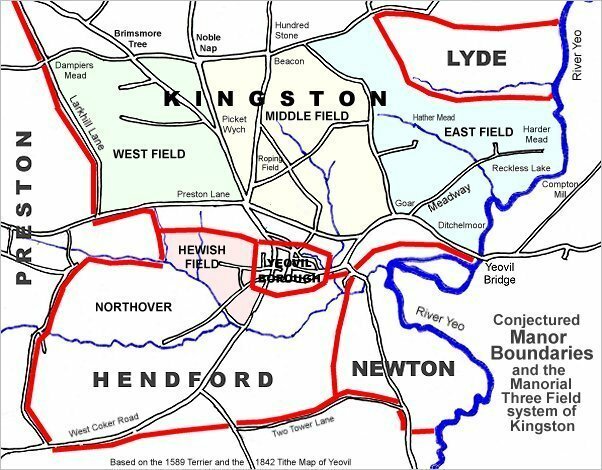 It rises in what had been the great Middle Field of the Manor of Kingston later, after the subdivision of the great manorial field, the source of the Milford Brook was in a field called 'In Green Cross', that is, a sub-division of the field Green Cross. In the 1842 Tithe Apportionment it was one of many fields owned by George Goodford and was farmed by Phillis Coles (later of Stone Farm - a detached part of the parish of Preston Plucknett) who lived in a house in the corner of the field, in Mudford Road, at the spot which is now the junction with Glenthorne Avenue. Green Cross was, roughly, where Folly Fields is today - in the area just east of Mudford Road and lying between today's Glenthorne Avenue (which wasn't there at the time) and Goldcroft (which was). 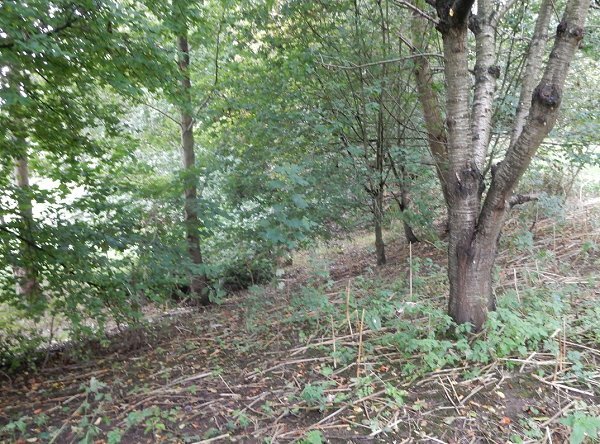 This was originally the head of a narrow, but steep-sided, valley the contours of which are now almost completely changed by infill and landscaping the area into four stepped terraces in the early 1950s. From Green Cross the stream ran due south through a field called Bullsclough (also owned by George Goodford and farmed by widow Phillis Coles) and meandered parallel to Goldcroft, but one field over to the east, until it met with Milford Road - at the time a rough farm track across the fields. Here there was a ford across the stream and Jack Sweet remembers playing there as a lad in the 1940s. By about 1950 the ground was being made up to carry the future Milford Road (see photo below) and a large concrete pipe ran under the newly-made up ground to carry the stream under the road and Chris Rendell remembers playing in the pipe as a lad in the 1950s. From here the stream ran through fields in a southerly direction until it met King Street after which it ran to the south east until it reached the back gardens of the houses on the west side of Ryall's Lane (later Kiddles Lane, today's Eastland Road) where, I believe, it still runs as a ditch. Today, from this point onwards, the stream runs underground and occasionally can still be heard at the roadside rainwater gully by the garages in Eastland Road. It then passed under Reckleford, flowing beside the newly-built Wyndham Street for a short distance before meandering across a field and an orchard before reaching Middle Street roughly where the old Liberal Club is today. Where the Milford Brook and/or the Rackel Brook crossed Fore Street, as that part of Middle Street from the Triangle to Central Road was known at the time, there was a bridge - mentioned in the 1589 Terrier ".... from Forestreet bridge to Penneway...." and "from thence to Forestreet bridge". Milford Brook then ran between two fields (that to the west was called the Withy Bed and was, presumably, somewhat waterlogged as the Rackel Brook ran into it. It finally ran into the Dodham Brook at Dodham. The 1946 aerial photograph of the northern part of Milford Stream. Mudford Road runs diagonally across the top left with an unfinished Glenthorne Avenue and Ashford Grove at top centre. Goldcroft runs from its junction with Mudford Road at top left down the photograph left of centre to join Reckleford which runs diagonally across the lower left and on towards bottom right. The Milford Stream begins in the pink shaded area at top, left of centre, runs across one field before flowing through two further fields and seen as a dark wavy line formed by trees and bushes on the banks. At the centre of the photograph it crosses what will become Milford Road at 'Milford Dip' (but at this time a farm track with a ford across the stream). It then meanders across the patchwork allotment fields as far as King Street which runs across the photo from Goldcroft to Highfield Road / Gordon Road at right. The stream then crosses another allotment field before running beside the rear gardens of Eastland Road and alongside Bide's Leather Works at the junction of Eastland Road and Reckleford at bottom right. After this the Milford Stream runs in underground culverts to discharge into Dodham Brook. 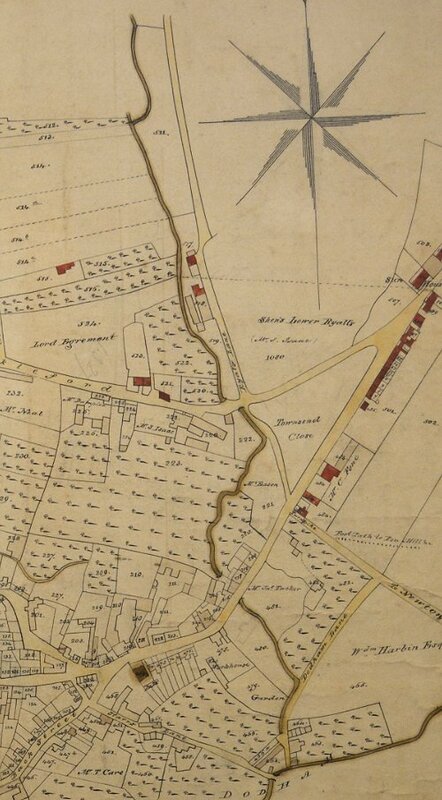 E Watts' map of Yeovil of 1831 showing the lower reaches of Milford Brook (in the days it ran above ground) as a brown line weaving its way down the centre of the map. At the top half of the map the brook runs parallel to Ryall's Lane (today's Eastland Road) before passing under Reckleford. It then ran beside the newly-built Wyndham Street for a short distance before meandering across a field and an orchard before running under houses and Middle Street to emerge on the southern side roughly where the old Liberal Club is today. It then ran between two fields (that to the west was called the Withy Bed and was, presumably, somewhat waterlogged as the Rackel Brook ran into it. It finally ran into the Dodham Brook (seen running across the bottom right of the map) at Dodham. 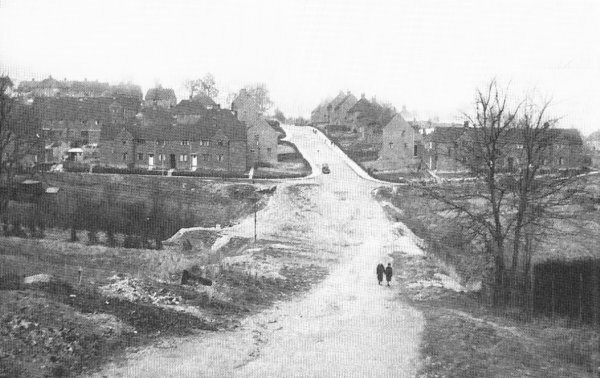 Milford 'Dip' seen from Milford Cross (at Goldcroft) circa 1950. Although Milford Road was not made up at this time, the open ford of the 1940s was no more and the stream fed through a large pipe running under where the ground was being made up - just about where the two people are walking. The Milford Stream valley, in fields both left and right, was yet to be built up to the levels we see today (see next photo). The former fields Bare Hills (Parcel 1010) running down from the left and Long Milford (Parcel 1011) to the right, heavily remodelled to form the current playing field. Photographed in 2014 from close to Milford Road looking southeast. Milford Brook, now in an underground culvert, would have run from roughly where I stood to take the photograph in a more-or-less straight line in the direction of the house seen towards the right side, which is in Portreeve Drive - built over the southern third of Long Milford. The steep sides of the former valley are still discernible at places along the top of the valley. Photographed in 2015. The head of the former valley that was the source of the Milford Stream was landscaped by almost completely filling the valley to produce four stepped flat terraces running between Goldcroft and St George's Avenue - the lower terrace alongside Milford Road is now allotments while the three upper terraces are now mostly used as a dog-walking area seen here. Photographed in 2015.